It was train versus tractor-trailer on Anderson Street in Mason Friday morning, when the truck’s trailer bottomed out on the crossing, and the train came minutes later. The truck was separated from its trailer, which was hauling a backhoe, leaving the two on opposite sides of the track. No one was hurt in the accident, but it left approximately a mile of crossings closed in the town from 10:30 a.m. to nearly 4 p.m., according to the Mason Police Chief Colton McKinney. 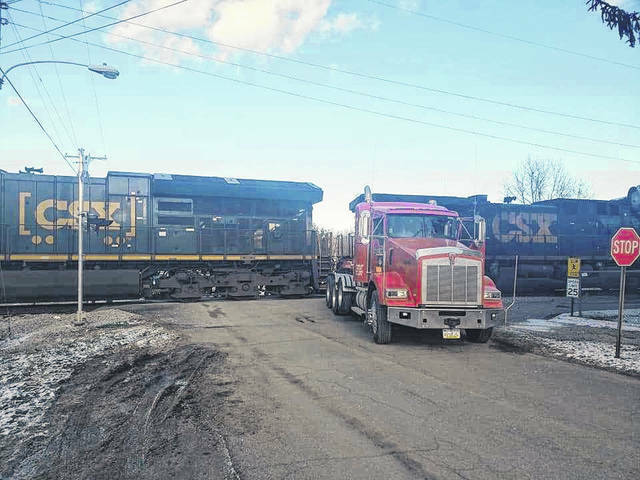 MASON — A tractor-trailer driver escaped injury Friday morning when his vehicle bottomed out on a railroad crossing on Anderson Street in Mason, and a train came minutes later. Mason Police Chief Colton McKinney said Eugene Fields of Charleston was driving the truck, owned by Maxim Crane Works. Fields was attempting to cross the tracks on Anderson Street, when the trailer became stuck. A train came minutes later, striking the vehicle, but Fields was able to exit the truck prior to impact. The collision left the truck on one side of the tracks, and the trailer, which was carrying a backhoe, on the opposite side. The chief said the trailer and backhoe landed approximately 10 feet from a nearby house. McKinney said there was nothing either the truck driver or the train conductor could have done to avoid the crash. 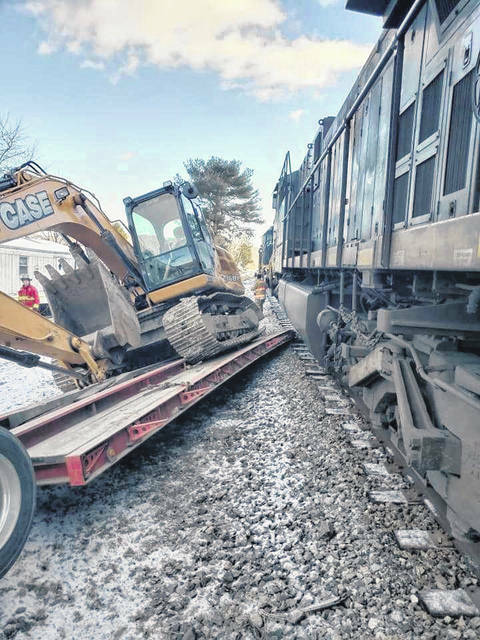 There was no mechanical damage incurred at the wreck, although the trailer and backhoe received extensive damage, as did the front plow on the train. The nearly mile-long train closed off approximately 10 crossings through town from 10:30 a.m. when the crash occurred, to nearly 4 p.m., according to McKinney. Also assisting at the scene were the Mason Volunteer Fire Department, Mason County EMS, New Haven Police Department, and representatives from CSX Railroad. The chief said the truck was driven from the scene, with Red’s Towing taking the trailer and backhoe.